Cheryl Strayed, author of Wild, called the PCT on the Hat Creek Rim “A legendary stretch on a trail of legends.” Indeed, for Cheryl, these are trail miles she will likely never forget. Having neglected to bring enough water for 100-degree temperatures and extremely dry terrain, Cheryl became dangerously dehydrated and overheated. Many recreational backpackers (not to mention day hikers) might be scared off by Cheryl’s experience on the Hat Creek Rim, but it is possible to use your own two feet to safely explore the Hat Creek Rim and revel in its stark beauty and expansive solitude. Please just carry lots of water, avoid hiking in the heat of the summer, and check conditions in advance. Read on for more details and advice. 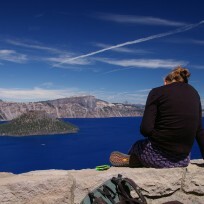 Day hikers scroll down for shorter jaunts to explore Subway Cave, the Hat Creek Rim Overlook, and Burney Falls. Despite it’s proximity to both the Sierra Nevada and Cascade Mountain ranges, the Hat Creek Rim’s geologic history is distinct. 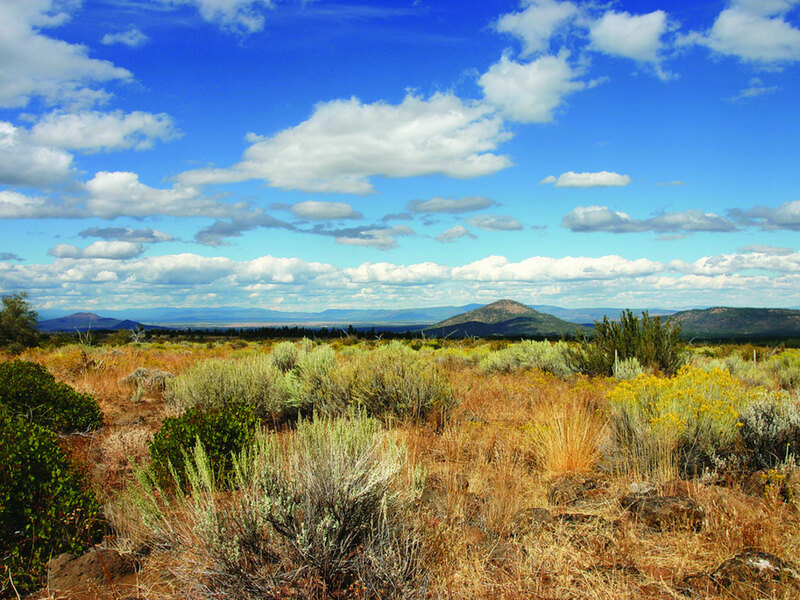 The Rim sits atop a small part of Central California’s Modoc Plateau. Nearly one million years ago active faulting gradually dropped a block of the Earth’s crust 1,000 feet, creating the Rim’s large escarpment. Crisscrossed by fissures and tunnels, the Rim is dry because most of the water drains into a lost creek below its surface. 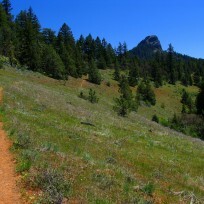 Spring is the perfect time to hike on the Hat Creek Rim. The topography is gentle but the hike should be considered “strenuous” because it’s long and dry. Don’t let this intimidate you, however. In spring, mild temperatures, wildflower displays, and views make this 40 mile, three-day backpack worth the weight of the water you’ll carry (and you’ll need to carry a lot). As a bonus, the hike begins and ends at the natural wonders of Subway Cave and Burney Falls (see below). This is a one-way journey requiring a shuttle or a second vehicle at the Highway 89 trailhead and McArthur-Burney Falls Memorial State Park. Your Hat Creek Rim ramble starts at the PCT trailhead 0.3 miles north of the junction of Highway 89 and Highway 44 near Old Station, Calif. Be sure your water bottles are full; it’s about 30 miles until your next water source, Rock Creek Spring. To cover this long waterless stretch of trail, you’ll want to log at least 15 miles on day one of this trip (great for fit, experienced backpackers). 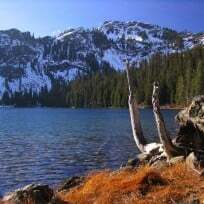 The miles should go by easily, however, because most of the trail along the Rim is level or downhill and you’ll be accompanied by magnificent views of the verdant Hat Creek Valley, Lassen Peak, Burney Mountain, and, further away, Mount Shasta. Along the way you will meander across youthful lava flows including Cinder Butte, a sparsely vegetated conical hill to the northwest, and Sugarloaf Peak, a young volcano to the south. There are many campsite possibilities on the Rim and sunset and sunrise vistas are spectacular. Your journey ends in McArthur-Burney Falls Memorial State Park (six miles north of Highway 299 on Highway 89 near Burney), where you’ll view 129-foot Burney Falls, one of the state’s most voluminous waterfalls. This is a fabulous May or June hike. Later in the summer, however, the often shadeless, arid route can be blisteringly hot. Check temperature predictions before heading out and carry plenty of water. 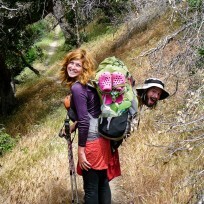 “In warm months each hiker should carry and drink about a gallon (4 liters) of water per day. Watch your ‘ins and outs’. Drink enough so that urine frequency, clarity, and volume are normal. You are not drinking enough water if your urine is dark, small in quantity, or non-existent in the course of a day’s hiking. In addition, eating adequate amounts of food will help you replace the electrolytes (salts) that you are sweating. Looking to explore the area without carrying gallons of water? 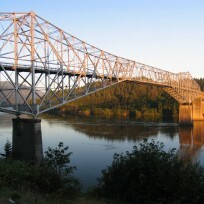 Visit Old Station (where Cheryl began writing her first novel), nearby Subway Cave, the Hat Creek Rim Overlook, and Burney Falls (where Cheryl waited for new hiking boots to arrive). 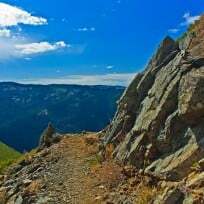 You can drive to the Hat Creek Rim overlook to take a short stroll on the PCT and view the dramatic geology of Hat Creek Valley. The overlook is located on Highway 44, three miles east of the junction of Highway 89/44 near Old Station, Calif. Outfitted with viewing scopes, this overlook offers a great vantage point of Lassen Peak (10,457 feet), Mount Shasta (14,162 feet), Crater Peak (8,677 feet), Burney Mountain (8,550 feet), and Magee Peak (8,550 feet). Hat Creek Rim Overlook includes interpretive signs, restrooms, picnic sites, parking space for RVs, but no water. Subway Cave near Old Station provides a rare opportunity for PCT users to explore the inside of an ancient lava tunnel. Approximately 20,000 years ago, fissures in the earth in this area sent large volumes of molten lava streaming across the countryside. The lava crawled northward for 16 miles, covering the entire valley floor. On the surface, the lava cooled and hardened into rock, while rivers of still red-hot lava continued to flow below. Eventually, when the lava stopped erupting, it drained away and left behind dark Subway Cave. At first the cave was hidden, but it became exposed for exploration when a portion of its roof collapsed to reveal “Devil’s Doorway” – which is today’s entrance to the 1,300-foot-long, subterranean grotto. You can find Subway Cave ¼ miles north of the junction of Highways 44 and 89, directly across from Cave Campground. Visibility in the cave is zero so bring a reliable flashlight. You’ll also want warm clothing and sturdy shoes: temperatures in the cave remain cool year round (hovering around 46º F no matter what the temperature is outside) and the walking surface is uneven. The 129-foot cascade in McArthur-Burney Falls Memorial State Park is, for eight months of the year, California’s most voluminous waterfall. Called the “eighth wonder of the world” by President Theodore Roosevelt, the falls were declared a National Natural Landmark in December 1984. With a daily water flow of 100 million gallons, Burney Falls’ output is eclipsed in California only by Yosemite Falls’ late spring and summer torrents. On sunny days the mist at the bottom of the falls is often filled with rainbows. Small dark sea birds, called black swifts, make summer homes in nearby lava cliffs and the park is known to be a nesting ground for bald eagles. Burney Falls was named after pioneer settler Samuel Burney, who lived in the area in the 1850s and was one of its earliest settlers. The McArthurs were settlers who arrived in the late 1800s. Their descendants were responsible for saving the waterfall and nearby land from development and giving it to the state in the 1920s, making McArthur-Burney Falls Memorial State Park the second oldest state park in California. Today the park encompasses 910 acres and includes a 1.3-mile trail around the falls. For backpackers, there is a large walk-in campsite. Trailhead driving directions: The PCT trailhead on highway 89 is 0.3 miles north of the junction of Highway 89 and Highway 44, near Old Station, Calif. McArthur-Burney Falls Memorial State Park is approximately six miles north of Burney, Calif., on Highway 89. 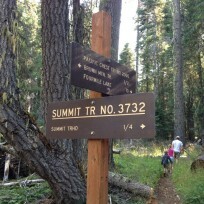 The PCT passes directly through the park. Permits: A California Campfire Permit is required if you plan on having a campfire or using a stove. The permit is your agreement to follow the current campfire restrictions and regulations.